If you’ve visited our blog before, you know that we are big fans of Words Their Way (shortened to WTW). This is an assessment-based, differentiated, leveled approach to spelling and word work. It’s encouraged, not required in our district. Teachers can implement the program however they see fit. Heidi has taken some trainings but most of our know-how is from the book and trial and error. We use the sorts weekly but do not use the program for spelling. Visit our post about Chunk Spelling to learn more about that approach. Hopefully this post will give you some insight and tips if you’re looking to implement WTW in your classroom. DISCLAIMER: At this time, we no longer use Words Their Way. We now use Word Play, a word study program that incorporates differentiated word sorting and other elements like chunk spelling. Some of those activities and games would make great companion resources to Words Their Way. But we will always keep this post available to you as a resource! To begin using WTW, we recommend that you gather some supplies. The Words Their Way book is a must. If you are teaching early childhood, we recommend the new Words Their Way for PreK-K book. You may have access to the sort books at your school. If you don’t you will want the sort books as well. The sort books in order from easy to advanced are: Letter and Picture Sorts for Emergent Spellers, Letter Name- Alphabetic Spellers, Within Word Patterns Spellers, Syllables and Affixes Spellers, Derivational Relations Spellers. In 2nd grade, we usually only needed the Letter Name- Alphabetic, Within Word Patterns, and Syllables and Affixes sort books. The first step in implementing WTW is giving the class a (rather lengthy) spelling test. We use the Primary Spelling Inventory (PSI) for 2nd grade. On the Pearson website there are examples of the different tests and run down on scoring them. Grading the assessment can be tedious, but it’s so great to see all the data. Each of the words is broken down into key components—beginning sounds, vowel sounds, suffixes, etc. You don’t analyze every part of every word, so you need the feature guide to show you what you’re looking for. You put the student’s test in front of you and start checking off what was written correctly. We made a form for the students to write their answers on. This form allows us to do a little record keeping right on their forms. The feature guide in the book is horizontal but we found it easier to grade quickly with a vertical page so we made our own form. We use the same page all year so it is easy to track student growth. We use a different color pen each time we give the assessment and color the key at the top of the page accordingly. After checking each word, then you total the number of checks in each column. The different columns represent different levels of spelling mastery. Each feature is checked in 7 different words. If a student correctly writes the feature (for example, short vowel sounds) 6 or 7 times you know it has been mastered. If a child gets 5 or fewer correct, that’s considered the student’s instructional level. This is the level the child will benefit most from practicing. Want our spelling test sheet and vertical spelling inventory? Click here to get our FREE Words Their Way Resources. After testing your students, the next step is to organize them for word study. The simplest thing is to grab a piece of paper and list the levels down one side. Then look through the assessments and see who fits each category. I write the number they got correct in that category on top of their name. The Within Word early group is kind of full. I can see that Diana only got 2 right but the others were much more solid on that level. So I may move Diana down to the previous level. If I have lots of kids on the Syllables and Affixes levels, I might put them all in one group and start them at the beginning of the level. Since the 1st grade at my school doesn’t use WTW, the kids may be natural spellers and have no understanding of word patterns. I think it’s important for my students to learn the why of spelling as much as the how. Even though they can spell the words, it is beneficial for them to get experience with the rules so they can letter extend them to spell other words. Keep in mind that this isn’t an exact science! In a WTW workshop I once heard, “Do what you can!” That’s the key. If you can manage 8 different groups with weekly reassessments, go for it. But if you are only ready for 2 groups with word sorts every other week, that’s okay too. Make it work for you! What is important is that you’re getting at least some differentiation. I decided I could handle 5 groups. I made a little notebook to keep track of the groups. There is a half-sheet form for each week. I cut down a post-it note for each group and added the kids’ names. (Using post-it notes makes it easy to transfer the information to the new sheet each week.) Then I list the sort for each week. Want to our group planning pages? Click here to get our FREE Words Their Way Resources. Now to deal with the actual sorts. This is the make-it or break-it point when it comes to using WTW. If you can handle this circus, the rest is easy. At Emily’s school, they ordered a ton of copies of each sort and she had a filing cabinet full of sorts at her disposal whenever she needed them. In case you aren’t that lucky, here’s a method that worked for me. I got some 6 pocket folders from Really Good Stuff, similar to these. I numbered each folder 1-6 and then used a post-it to label the pockets inside with the group level and number of kids. Each folder holds one week’s worth of sorts and each group has its own pocket in that week’s folder. The next step took me awhile, but now that it’s done I’ll never have to do it again! I went through the different sort books (for 2nd grade that’s Letter-Name Alphabetic, Within Word Patterns, Syllable & Affixes) and copied each sort on yellow paper. I did them double sided to fit in one binder. Now, every 6 weeks or so, I take my folders, binder, and record notebook to the work room. 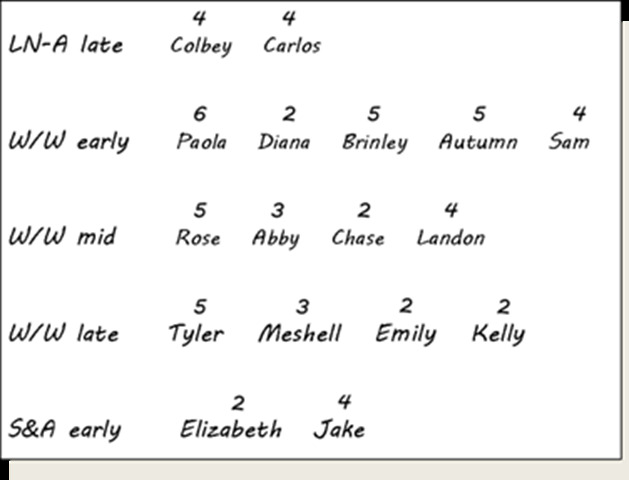 I figure out what each group needs for the week and put the copies in the correct pocket. This is when having the master in yellow comes in handy- I never mix it with the copies! I can copy and organize 6 weeks worth of sorts in less than 30 minutes! The only other supplies you need are a spiral notebook for each student to do their daily sorting, a zipper pocket for each student to hold the weekly sort (we reuse these for a couple of years until they are too beat up), and highlighters for introducing the sorts on Day 1. With Words Their Way, the focus of the program is sorting the words. It’s a great way for children to learn but it can be tedious to do it day after day. The book has lots of different sort suggestions and I’ve tried most of them. Over the years, my system has evolved, but this is how it looks most recently. Since starting the Daily 5 a few years ago, word sorts are the first thing the students do when they go to the Work on Words station. On Monday, they sort and write. Tuesday is the favorite: speed sort. I found some sand timers from Oriental Trading. Wednesday they sort and graph. And Thursday they sort and glue the words into their notebooks. And on Friday we start with the new sort. They can do each sort in less than 5 minutes. There is no one right way to do this. Find what works for you! Because I don’t use WTW for spelling words, I don’t do a “spelling test” of their sorts every week. However, I repeat the PSI assessment (mentioned at the beginning of this post) every quarter. After assessments I will rearrange the groups as necessary. The WTW level sort books provide periodic assessments that I have great intentions of using, but don’t always (okay, very rarely) get time to use. I’ve found they provide helpful, but not crucial information, so don’t beat yourself up if you can’t fit them in to your schedule. Doing the PSI a few times a year is really a good measure of where my kids are and they don’t typically change so much in a quarter that you need weekly assessments. Words Their Way is so thorough in scope and sequence that most of my students progress from one sort to the next in order. Occasionally (especially with my ELL students), there will be a big jump in acquired skills, but most students will go step-by-step. The PSI assessments are still important, though, so you can make sure they are actually progressing and that students are still working at their instructional levels. It sounds like a lot to take on, but once you establish your organized system, the whole thing will run like a well-oiled machine. And the growth you see in your students will be worth all the hassle of setting it up. In the years I’ve been diligent with the program, my kids were much more confident in their understanding of spelling patterns. In the years when I’ve let it slide, I may have some really good natural spellers, but they don’t understand why words follow certain patterns. If we want to shape good little spellers, it just makes sense to teach them how to think about words. I have to pilot the program in third grade this year. Do the students just move to the next sort each week, or must they pass some sort of assessment? This post has been invaluable! The students just advance to the next sort each week unless while working with them you get the impression that they dont really understand the content. When you do the PSI each quarter youll be able to see if they need to move back and do some of the sorts again. I didnt see that very often though. I feel like my students need exposure in the classroom to words in this manner, not just for spelling, but for reading. Do you fee their is an impact on their word attack skills when students are blending unfamiliar words? Sorry for the their/there mix up!! I am loving your recording page! It is so nice to be able to see the growth in one quick view. One tip that saved a lot of time for me was to scribble/swirl on the back of the word sort before cutting it apart; just use a different color than the other kids in your group. That way they can keep track of the sort without having to take the time to do it carefully. I wouldn’t say there’s a 100% transfer of word attack skills from WTW sorts to independent reading words, but it’s a lot higher percentage of transfer than other things I’ve done. When WTW is combined with some activities like Cunningham’s Guess the Covered Word or Rounding Up the Rhymes or our Chunk Spelling, it’s a powerful tool for helping kids decode words independently. I have an observation about The Primary Spelling Inventory recording sheet. Word 15 you have as chewing but on Pearson it is chewed. Great post! Here’s a tip: instead of having them initial each word, have them color the back of the sheet in a zigzag pattern before they cut it (you can give each student a crayon from a box to keep in their sort bag). This way when you find the random word on the floor, just ask who has that color – they will know their color by week 2! So much faster than initialling each one! Love the information! I am moving to 3rd grade after 14 years in 2nd! I am also moving to a new district that has WTW. Do you send different spelling words home with your students? I saw that you said that you do not send the sorts home with the students to study. My nephew attends a school that sends the sorts home as their weekly spelling list.I am just trying to figure out the best option for me! Thank you! Any chance you have the labels that you used for the files to organize the sorts? I am loving the way you re did the assessment form! Thanks so much for sharing! I love how nicely you’ve laid everything out for teachers! I’m trying to download the copy of your assessment form but it’s not opening anything. Would you be able to send me a pdf copy via email @ cpalma@wsd1.org, if it’s not asking too much? Nevermind, I just used the other link and it worked. Thanks so much! As soon as I can find a spare moment I’m going to try and get these added for you. For some reason I could download your Primary Spelling Inventory Feature Guide yesterday (17th July 2014) but not today??? It is probably a system problem my end as the other links work fine. Just in case, is there another link elsewhere on the site or is there any way the link is broken? Try right clicking on the link and saving the file that way. Have been using WTW for awhile, but haven’t found a successful way of implementing…your ideas are great! Love that you posted this information for classroom teachers! I’ve been using WTW in remediation groups, but I only see students 2-3 times per week. I’ve precut and bagged sorts for reuse to save time, plus the kinders and some 1st graders have difficulty cutting. I’ve used small ziplocs and labeled each sort, but the amount is getting overwhelming. Any suggestions for storage? Also, do you think condensing activities with the sorts into 2-3 days is ok? Love your planning organizer for the 5 groups! I’m trying to download it, and it may be something off with my adobe reader or computer, but it will not download. Is it possible to email it to me when you have time? I would appreciate it so much! 2-3 days I’m sure is fine or you could stretch one weeks worth of activities for 2 weeks. I don’t know about the bags. Good luck! We’ve been using WTW for over 5 years. We found that giving just 12 words from a sort left you another 12, in case the students needed to repeat a skill for a second week. We do use them as their spelling words. If they understand the patterns in twelve, they would understand it in all anyway. We found using a composition book kept pages in better. We sort and write daily in it , plus, do another skill, such as abc order, illustrating the words, using in a sentence. I combine it with my readers workshop, so one day as they are reading independently they must write down all the words they come across that match their patterns. It is so fun to hear them get so excited when they realize words they read daily match their patterns. I staple a Baggie in the front of the composition book to keep their sorts for the week. For the test, they must spell correctly and sort correctly. They get points for both. They also, get points weekly for their journal. Keeps them accountable. I like your forms. I would suggest if someone is using the original forms, it is so much quicker if you just check the things they miss and not the items they get correct. It still will show the pattern of where they are, but it is easier to see, at least that’s how my brain works.less tally marks. I am familiar with WTW from courses in college and am piloting the program in my grade this year. My twist is that I am in a middle school setting, so I will have 5 different classes. What are your suggestions for managing such a large group of students? Thanks in advance! I love the post about WTW. I have used it in my room before but I have never been able to figure out a good routine. One question that I have is for the writing the sort down what do you do for those students on a picture sort? Many of my students are do the blend sorts and those do not have words. Do they just sort the pictures? What would they write down? Thanks so much. What do you do for students that are on the picture sorts for the write the sort day? I am trying to get this going and I have a few students on picture sorts. Hi Nicki! They sort the pictures and then write the words as best they can. They don’t have to spell the whole word correctly, but I hold them accountable for the feature we’re looking at that week. Perfect. Thanks so much for the quick response. YOU-ARE-AMAZING!!! Your posts are invaluable. Thank you for sharing this information with all of us. THANK YOU ~ THANK YOU~ THANK YOU!! The file labels would be a great addition. Thanks for all the work you do and the support you provide for your colleagues. I printed all of the cards on card stock, laminated, and labeled all of my cards for half day kindergarten. I just didn’t have time waste with them cutting the cards themselves. I stored them in a small drawer organizer like you would get from Home Depot or Lowes. The kids were great at finding and replacing them all! I’ve tried a hundred ways, but I can’t seem to get the vertical inventory. Could someone repost or send it to me? Thank you SO much for this post. It has helped to give me the tools I need to get Words Their Way going in my classroom. How do you incorporate chunk words into your week? We are looking to use WTW for our fourth graders at my school. How many books or levels do students make it through in a school year? I know you teach second but we are looking to purchase the consumable books for our student. We aren’t sure if students move through multiple levels in one school year. I’m not sure how much my experience will help, but I’ll try. With my 2nd graders, occasionally one would really jump up, but usually they progressed step-by-step from where they were assessed in the fall. Most kids stayed in their level for the whole of the year, but I usually had a few who were end of Within Word Pattern and they would progress to Syllables and Affixes within a few months. I also had a few stragglers who would need a few months in Letter-Name Alphabetic before moving up. Thank you so much for posting all of this valuable information!!!! I love how it is so organized! When you move your students to another group (up or down), do they restart the sorts (from the beginning) or do they just start where the rest of the group is (and skip the missed sorts)? Typically when I’m moving students, I have several who are moving at the same time, so I would just make them a group and start them where they need to be (their assessed level + paying attention to the early/middle/late categories). If I’m just moving 1 student, I would put him/her with whichever group most closely aligns with their level. As far as starting at the beginning, as long as they’re in the right early/mid/late grouping then starting at the very beginning of that section isn’t vital because their getting enough exposure at their particular levels. But it’s best to err on the side of too easy. If I have a group of Within Word Pattern spellers at the middle level and one student ready to progress to the late level, I just keep that student at the middle level. It’s not harming him and it’s close enough to his actual level to still provide a challenge and give the support of a group to work with. After you reassess each quarter, have you ever moved students up a few sorts or to the next level? I’ve never done WTW but have noticed that students will quick growth spurts in reading. I’m trying to wrap my head around how I would implement this with 1st graders. Do you have the order of the word sorts anywhere? Or are they simply in the order found in the back of the book? Or, did you create and group together sorts how you liked them? I noticed that you mentioned using the Spanish version of WTW, do you mean Palabras a su paso? Have you been using if for a while? How do you like it? Do you have any tips for this dual language teacher? Do you have a blog I can explore? Sorry Ganske. Auto correct didn’t like it. Also, trying Daily 5 this year with it too. I would like to have more info on the Daily 5. Hi, your stuff is so helpful- thank you! Just wondering though, their is another new list out their of words for the test- FAN, PET, DIG, ROB, etc…. are you using the old list? Thanks! I’m not sure I understand the question. Is there a problem with the test forms? Wow thanks so much for sharing! I am moving down from two years grade of 4/5 to a 1/2 and am panicking a bit with so much focus on reading. I have been scouring blogs and yours has been so helpful.I love words their way and used it with the older kids especially the root words. Thanks for laying out your program so clearly and sharing your resources. I also love the ‘chunking’ idea and will try it out. I will also check out your store. Did the labels get posted somewhere? This post has helped me SOOOOOO much!! I love these so much more than the original WTW error analysis chart. Is there a possibility for a Second Story version of the the scoring guide for the upper spelling inventory (USI)? Or maybe sharing how you created this format? I was looking at your primary feature guide. On the word “spoil”, you are assessing the “sp”, but the Pearson feature guide assesses the “tr” in tries. Would you be able to update your feature guide to match Pearson’s feature guide? I have never really been a big fan of using Words Their Way for spelling, but prefer Patricia Cunningham’s Making Words,etc. However, this year I am also going to use WTW as a means of providing word pattern knowledge and simply as a research to see if it is effective with helping struggling/striving readers. I am very appreciative of your help and great information. I am a private reading specialist and would love to know where you would start a kid on words their way if they are in 2nd grade and reading at a very late 1st grade level? What book would you get? what book would you start with? If you could let me know it would be of huge benefit. Hello I have the one book Words their Way without any supplemental books. I have found sorts but where do you find the spelling list? This is AMAZING!!!! Where are your sorts from? Can you tell me more about how you organize, so I am better able to deal with the chaos?! Thank you in advance! Hi I have heard of this program in New York but I am now in Tennessee and our school doesn’t have the program. I think it would really help my students out so I wanted to buy the books….what do you recommend? I work with grades 4-5 special education students reading at grades 2-4. I didn’t know if there was a certain book I should start with? THanks! You’ll need to get the large Words Their Way book and go from there. The sorts are from the WTW sort books. I’m not sure that I know what you mean by spelling lists. There are different sort books for the different WTW levels. You could generate a spelling list from those sorts. I am really hoping you can answer this question! Our school uses the sorts as the weekly spelling tests. The test has the targets at the top of each column. The student must write the word presented in the correct column and spell the entire word correctly. The word is counted “incorrect” even if sorted into the correct target category, but the rest of the word has a vowel pattern incorrect. For example, the target is teaching consonant blends /sl/ /pl/ and /bl/. The word is “sleeve” and the student writes the word in the /sl/ column, but writes “sleve.” That is counted as incorrect on the test. Is this appropriate? Can you refer me to literature that would explain this? Thank you so much. A great site for beginners like me! I am an Australian teacher. Is it possible to get a modified version with some Australian spelling and our seasons for the primary and elementary inventory feature guides? If I could have your email address! I can give you more information. Thanks again. Your vertical spelling inventories have been so helpful to us at our school! Every teacher uses them and we pass them along grade to grade for each child. Do you have an upper elementary version or would you mind sharing your format for document so I could create an upper elementary vertical inventory sheet? We’d really like to stay consistent with this style. Thanks for sharing your great work! THANK YOU! I am sharing this with my district’s reading specialists today! I appreciate the clarity of your writing and the attachments. Thank you for sharing! So helpful! One thing I’m confused about, if for example you know a student is in the middle within word stage, how do you know which sort to start with? I look to see what a lot of the group needs to work on and choose the sorts that fit. For example, if most of the kids in the group get long vowel with silent e, but a lot of them are missing the ai digraph, I’d start with those sorts. Hi, I was just wondering if you have an editable version of the feature guides? I am from Australia and we spell favor “favour” and civilize “civilise”. My school has just started using WTW and we love it but it gets confusing sometimes when we are marking and need to remind ourselves of the spelling choices! Not sure if you will get to see this, but thank you in advance for any help. I have given and scored the PSI for my kindergarten kiddos and I’m struggling with what sort (and from which book??) to start each group. As for where the kids scored, I have 4 beginning consonants, 3 final, 3 short vowels, 5 consonants digraphs, 2 consonant blends, and 1 long vowel patterns student. Any insights you could offer would be great! We are just starting out with WTW in our district. The top of the record sheet will tell you at which level each column falls. So your kid working on consonants would be the Letter Name Alphabetic level. Decide how many groups you want to work with and choose sorts from the sort book that will fit the needs of most of those kids. It’s okay if you start at a level lower than the highest kid in the group. The review will be beneficial. This is such a great resource and I’m so glad I found it! Thanks for sharing so much valuable information! Hi There, good info about WTW. I’ve been using the CD that comes with the 5th edition to record their inventories (although the year stamp for them is now too old). It looks nice but takes a lot of time. I like this vertical version and having it all on the same page all year. Do you have one for the upper inventory or the template? I also use 5 groups and sometimes it isn’t clear which group to put them in. Instead of a folder with all their sorts, I use a hanging folder plastic bin and when a group is starting a new unit, I copy what is needed for that unit and save it in there. I used a large rolling 6 drawer organizer to put the weekly sorts into. I labeled the drawers with the group members. Each Monday they come in and get the sort themselves. Each day they do a different activity. I do try to do the spell checks at the end of each unit. I have upper grade kids at a school with iPads, this year instead of pulling groups to teach the concept, I am trying out the app Aurasma (augmented reality) where they scan the headers and title with it (on a white piece of paper) and a video of me explaining it comes up over the sort. I made it public “Words Their Way Lessons” from ahodge79 So far I did all the Within Word Sorts and will be working on the next two levels this year. This website and information is great! Thank you for posting! I would also be very interested in seeing the vertical organized diagnostic form for the intermediate and upper spelling inventory. The primary and elementary vertical inventories are fantastic and so helpful, is there any possibility you have it for the other two inventories? Thank you! I have a question…after testing the students, how do you know exactly which sort to begin with? For example, a student that is in the Within Word middle, which sort do I begin at? Is there a guide to this? Look to see what topics are covered for the middle level of the assessment for that level and start the group on the corresponding sort. Hello. I have opened your spelling list assessment page before and now I have lost my copy that I saved. Is there another way I could have a copy? I love your WTW pages. You should be able to find any of the downloads in the links of this post. It will not open for me. How do you know which sort to start your students in? For example… my students are early letter name and middle? I would assume I start my early letter name students on sort 1, however, would I start my middles on sort 6? 13? I’m not sure how to figure this out. Your resources and post are wonderfully helpful! I need some guidance–I have been using WTW for 4 years. Our 1st grade is required to implement it this year. Most of the classes have students falling at initial, short vowels and digraphs. I would use the digraph sorts with words rather than pictures because the students already have mastered initial/final and short vowel sounds. However, some teachers disagree, wanting to use digraph pictures instead…however, the sorts that follow, if you go in order, are short vowels and those students have already mastered that. What advice can you give me about where to start these students–pictures or the digraph word sorts? The Words their Way books have the words according to the sorts. You will need all the books to help you understand some of the sorts. The WTW books has the test you give to analyze students’ knowledge of word parts. Good Luck on your new job. Thank you so much for sharing. We just mandated WTW this year, so your resources are very helpful. I saw that you have the vertical Primary Spelling Inventory and the vertical Elementary Spelling Inventory. Do you by chance have a vertical Intermediate Spelling Inventory?